4nobltru.pdfThe Four Noble Truths17145 viewsThis booklet was compiled and edited from talks given by Venerable Ajahn Sumedho on the teaching of the Buddha: that the unhappiness of humanity can be overcome through spiritual means. The teaching is conveyed through the Buddha's Four Noble Truths, first expounded in 528 BC in the Deer Park at Sarnath near Varanasi, India and kept alive in the Buddhist world ever since. buddasa.pdfHandbook For Mankind13648 viewsAs a guide for newcomers to the Buddha Dhamma (the Truth which the Buddha awakened to and subsequently taught), this book is an invaluable guide. In it are contained the essential teachings of Buddhism. The Handbook is especially useful for those who approach the Buddha's teaching not as a subject for scholarly study but as a means to understand and ennoble their lives. It includes chapters on 'Looking at Buddhism' and the 'True Nature of Things'. artliv12.pdfThe Art of Living13528 viewsThe Art of Living with Ven. Master Chin Kung, a Master of the Pure Land School of Buddhism. The Art of Living has chapters on: The Education of Buddha Shakyamuni, our Original Teacher; The Four Kinds of Buddhism Today; How Homemakers Can Cultivate the Bodhisattva Way in Daily Life, and an excellent Question and Answer section. Included is a glossary and a contact list of Ven. Master Chin Kung's teaching centres around the world. That turns deathâ€™s bliss to gold. I speed to deck that lustless floor. gqga2.pdfGood Questions, Good Answers (English)11564 viewsThis is a very popular book on questions and answers on basic Buddhism. Read the answers to questions that people often ask about the Buddha's Teachings with Venerable S. Dhammika. The book covers topics such as What is Buddhism? Basic Buddhist Concepts, Buddhism and the god Idea, The Five Precepts, Rebirth, Meditation, Wisdom and Compassion, Vegetarianism, Good Luck and Fate and Becoming a Buddhist. animagnt.pdfAnimal Magnetism11329 viewsThis booklet is a good reminder to us, so that we always strive in the right direction. Practice is the only way. Even though faith and devotion to one's teacher can be a positive thing, we must always remember that an excessive faith is accompanied by corresponding deficiency of wisdom. Karaniya Metta Sutta - Discourse on Loving-kindness. 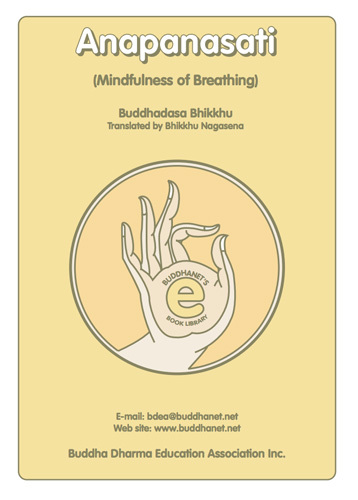 anapanasati.pdfAnapanasati - Mindfulness of Breathing9602 viewsFor the first time in the English language a comprehensive manual of Buddhist meditation known as anapanasati (the development of mindfulness of breathing) is available. Although this manual is primarily intended for the benefit of monks, it will greatly assist laymen, too, who wish to undertake a course of meditation but who do not have the guidance of a teacher. Originally published in Thai, this manual is one of the major works of the Ven. Buddhadsa Bhikkhu and delivered in 1959 in the form of a series of lectures to monks of Suanmokkha Monastery, Chaiya, Thailand. Ven. Buddhadasa Bhikkhu, a major voice in the Buddhist world, is an accepted master of Buddhist meditation. In constructive positive language, the manual guides the meditator through the 16 steps of anapanasati.